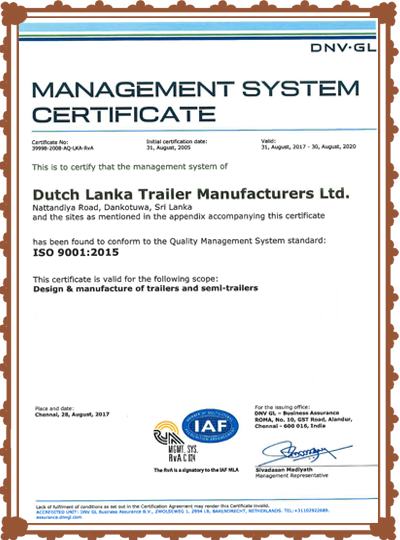 Dutch Lanka Trailers (DLT) is committed to maximize customer satisfaction and strives to achieve the of excellence by continual improvement through ongoing design and development, manufacture and sale of reliable, safe, cost-effective, quality products and services of international standards, by using environmentally sustainable technologies for improving levels of efficiency and productivity within its plants and ancillaries. 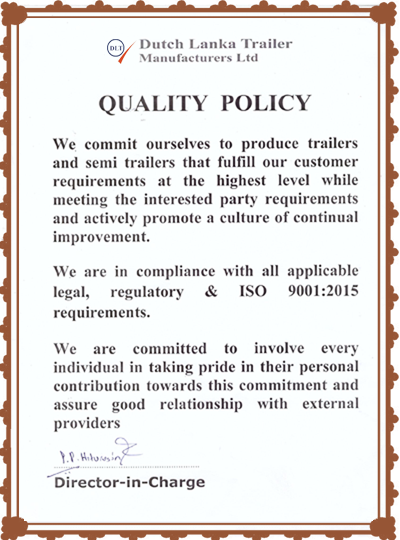 DLT also has a commitment towards improving the quality of life if its employees, both within and outside its plants and offices, through improved work practices and social welfare schemes. Rajagiriya ,Colombo , Sri Lanka.